With purple prose Bradbury waxes nostalgic about childhood bogeymen, wonderfully creepy. 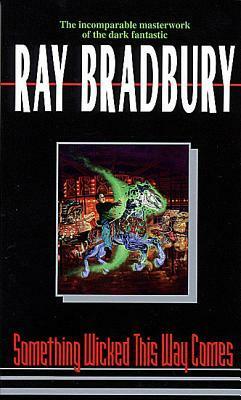 This book is part of Bradbury’s loosely constructed Green Town trilogy (there’s also a collection of related short stories). A sort of classic tale in its telling, the story unfolds as a nostalgic coming of age yarn mixed with horror involving two young boys. The main struggle explored by the author is that of desire and temptation. Chiefly this evolves between the contrasting main characters. The protagonists, Will and Jim, are best friends, with the main difference being that Will is a bit more cautious and Jim is a bit more adventurous with a slightly edgier worldview than his friend. Will’s father (another main character), is old—to put it simply. Charles has come into fatherhood later in life and doesn’t know how to make amends with that, as the youth of his son seems only to be a constant reminder of how aged he is. This dynamic sets the stage for things to come. Enter the horror. Bradbury’s language is flowery, purple-colored prose from an older time. In looking at other reviews, it seems that this style is off-putting to some readers. Bradbury does not take a “window pane” approach to describing things (as author Brandon Sanderson might describe the style). His words fall from the abstract and are more akin to poetry. The author paints the scene with notes and chords and melody. The wording is thick and may take some chewing, depending on your mood or frame of reference. It’s is rife with allusion. That’s not to say that the story is not there—nor is it boring or stylized. There is real tension and suspense. But, Bradbury coats the story in vivid hues to invoke tone, mood and perhaps the nostalgia he must have been thinking of when he wrote this. Indeed, the story itself is inspired by the author’s own real life childhood experience from when a carnival came to his hometown. Still, no matter the author’s style, there is a clear framework of a story. At times, it may seem a bit long—but not much. It’s easy to see how other authors (like Stephen King for instance) were inspired by someone like Bradbury, when you have scenes involving sewer hideaways and sideshow freaks stalking through town on ill intent missions to find the two pesky young boys. Each time the protagonists escape the clutches of the Carnival, a new struggle ensues with solid reversals of fortune. And there is also the ever-present worry, that nobody will ever believe what is really go on here. Another thing to note of Bradbury’s style is his use of the language to construct scenes. His prose may be purpled—but it is not so verbose. He has a wonderful way of describing these evil things lurking about the town as they tangle with the protagonists, and he does this without resorting to overwrought, visceral descriptions of violence. I felt particularly creeped out by the Dust Witch, Mr. Dark and even the eviscerated Mr. Electro who drolled out stoic declarations like a half-dead toad. All the characters of this dark Carnival had a presence, though not described in complete physical detail–I still had a sense of them. I could feel the mood, the fear they put into the protagonists. The story is a tad romanticized, and perhaps the voice of the young boys feels out of age at times. Yet, it pretty much works. All the capers the two get into seem realistic enough and appropriate for their age. The evil of the Carnival provides a stark contrast to the idyllic air around the boys, which keeps the nostalgia from going overboard. Also wonderful is the way that Bradbury creates problems between the boys, who are the best of friends in every sense of the word (at times they seem like they are right out of a 1950’s sitcom). However, the absence of Jim’s father coupled with his curious and more daring side give him a darker edge and we are genuinely worried about him—just as Will is. This also rings true for Charles (Will’s father) who starts off as a nice fellow, but weak. We get to know Charles and understand his feeling of helplessness and struggle through this with him as he must put aside all his neurotic worrying about getting old, embrace life, and understand that his age is what it is (and that it is not even close to as bad as he has convinced himself it is). This story started out as a short story first (check out the slightly darker version called “Black Ferris”) and then morphed into a screenplay which Bradbury hoped his friend Gene Kelly would produce. That never happened so Bradbury took the time to turn the treatment into a full novel—which is what we have here. The book is a story of boyish adventure, yet Bradbury’s style makes the stakes much grander. The Carnival is not just some group of street criminals meant to rip off the good townspeople. There is something more sinister at work. Jim, Will, Charles and the citizens of Greentown come face to face with the physical manifestations of evil of the world and learn that even their small idyllic town is not safe. The struggle is eternal, for today’s struggle will be yesterday’s battle. The war lasts a lifetime. Yet, it’s not so heavy as all that, when the protagonists learn that they must trust to life’s good graces to keep evil at bay. They find the necessary strength within themselves to arm against the evil “Autumn People” of the world. Lastly, the elixir of life plot device, which Bradbury plays with in this story, is also refreshingly simple and yet a wonderfully unique take on this common trope. What dangerous consequences lie behind the glorious promises of a fountain of youth? Read and find out. A heartfelt tale through and through. Podcast: If you enjoy my review (or this topic) this book and the movie based on it were further discussed/debated in a lively discussion on my podcast: "No Deodorant In Outer Space". The podcast is available on iTunes or our website (www.nodeodorant.com). Sign into Goodreads to see if any of your friends have read Something Wicked This Way Comes.